May 14, 2015 (Halifax, NS) – Nova Scotia Power, in partnership with Atlantic Superstore® and AddEnergie, is proud to announce the installation of the first high-power electric vehicle charging station in Halifax. The new charging station, located at the Barrington Street Atlantic Superstore®, is the second of its kind in Atlantic Canada and has the capacity to charge an electric vehicle in one sixth the time it takes standard stations. Anne-Marie Curtis, Director of Marketing & Sales for Nova Scotia Power, noted the charging station’s importance in the adoption of electric vehicles in Nova Scotia. Mark Boudreau, Director, Corporate Affairs (Atlantic) for Loblaw Companies Ltd. says as more customers are purchasing or considering using electric vehicles, it makes sense for them to collaborate with industry organizations to provide the best possible infrastructure. AddEnergie, the owner and operator of the largest charging stations network in Canada, the VERnetwork, is pleased to launch the first dual port fast charger in Atlantic Canada. Louis Tremblay, President & CEO of AddEnergie, says this launch is part of the actual effort of the VERnetwork and its partners to link Ontario to the Maritimes with fast chargers. “We want to thank Loblaws and Nova Scotia Power for their support and their vision,” says Tremblay. While the region has dozens of charging stations, the high speed station increases the convenience of charging and makes longer trips possible. Its location will strengthen the province’s profile as a destination for travelers and tourists using electric vehicles and will also provide a convenient option for local and commuting electric vehicle owners. Several electric vehicles were present at Thursday’s event, including a, Nissan Leaf, Tesla Model S, BMW i3, and Ford C-MAX Energi. The launch of this charging station is just one of the electric vehicle milestones taking place in the province this month. For the first time, Electric Mobility Canada will be hosting their annual national EV Conference in Halifax at the Westin on May 25-27. 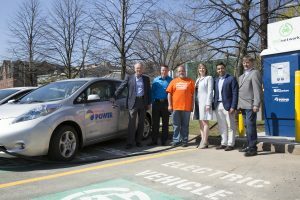 Leading up to the conference, the public will have an opportunity to explore and test drive different models of electric vehicles at Nova Scotia Power’s Ride ‘n Drive event, taking place on Sunday, May 24, 2015 at Nova Scotia Power’s head office on Lower Water Street. For more information on the VERnetwork across Canada, visit www.vernetwork.net. For more information on Electric Mobility Canada’s EV Conference, visit http://emc-mec.ca/ev2015ve/en/. OWNERS OF ELECTRIC VEHICLES NOW HAVE A FASTER, EASIER OPTION FOR CHARGING THEIR CARS IN HALIFAX. THE CITY’S FIRST-EVER HIGH SPEED CHARGING STATION HAS BEEN SET UP AT THE BARRINGTON STREET ATLANTIC SUPERSTORE. IT’S ONLY THE SECOND HIGH-SPEED CHARGER IN ATLANTIC CANADA, AND DOES THE JOB IN ONE-SIXTH THE TIME OF STANDARD CHARGING STATIONS. NOVA SCOTIA POWER UNVEILED THE NEW CHARGER TODAY, IN PARTNERSHIP WITH LOBLAWS AND ADDENERGIE. ANNE-MARIE CURTIS, DIRECTOR OF MARKETING & SALES FOR NOVA SCOTIA POWER, SAID THE HIGH-SPEED CHARGING STATION IS AN IMPORTANT STEP AS MORE CUSTOMERS MAKE THE SWITCH TO ELECTRIC VEHICLES. From left to right: David Stevenson (EV advocate), Mark Boudreau (Director, Corporate Affairs, Loblaw Companies Ltd.), Darren Hillier (General Manager, Barrington Street Atlantic Superstore), Anne-Marie Curtis (Nova Scotia Power), Sanjeev Pushkarna (Nova Scotia Power), and David Swan (EV advocate) with the Nissan Leaf™, being charged using the new fast-charging station at the Barrington Street Atlantic Superstore.